We are a generation striving for something. God places specific unique desires on each of our hearts. However, many of us will quickly give up on our God given passions because we don’t see instant fruit or profit. We will turn our lives into an aimless mission that leaves us puzzled as to what our purpose is. Wow. What a statement to live by. We worry so much with controlling our finances, our futures, our plans. But if we choose to live by faith and truly trust and follow God’s plans for our lives, He will direct us toward greatness when we are well equipped and prepared. This can only happen if we are able to be humble with where we are and thankful even with the little things. Are you being a good steward of the tiny opportunities God has already entrusted you with? If you want to be a chef, you may have to start out washing dishes. If you want to be a fashion designer, you may need to be an assistant. If you want to be a CEO, you will need to be an intern and get coffee for the big boss. If you want to be an actor, you may need to do extra work. The thing is-if you are doing what you love and what God has put on your heart, it will delight you. 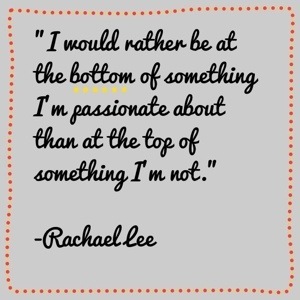 Wouldn’t you rather be at the bottom of something you’re passionate about than at the top of something you’re not?